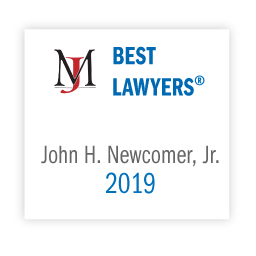 John H. Newcomer, Jr. practices in the areas of real estate and commercial litigation. His experience in these dual fields provides his clients with a rare perspective in dealing with complex real estate and business matters. Understanding the dynamics of litigation, and how it impacts his clients’ business strategies, gives John the ability to draft transactional documents with an eye towards avoiding problems before they arise. John chairs Morris James' Real Estate Group. In his real estate practice, he represents landowners and developers in the acquisition, improvement and financing of properties in Delaware, including hotels, medical and assisted living facilities, apartments, shopping centers and malls, restaurants, residential developments, schools, condominiums, warehouses and other industrial sites. He also assists clients with the review and negotiation of leases. John’s litigation practice involves a wide range of business, contract, and real property disputes. His experience includes cases dealing with land purchase and sale agreements, construction defects and disputes, leases, adverse possession of real property, zoning and deed restrictions, breach of fiduciary duties, non-compete agreements, contract and commercial disputes, and estate litigation. He is frequently called upon to assist clients of other members in the firm when they become involved in complex disputes involving their real estate or other commercial transactions. John also handles mechanic's lien actions. His experience as a certified mediator of the Delaware Superior Court gives John the additional insight to resolve his clients’ disputes before they turn into costly litigation. Represented landowner in breach of contract action involving the sale of land and payment of development expenses in connection with a large subdivision in New Castle County. Several of the defendants entered into a settlement agreement relating to the release of lots, and a judgment was entered against other parties arising from their failure to pay their required share of the build-out of the common areas of the project. Represented 50% owner of two apartment complexes in dispute with the other owner, who controlled the management of the two properties. Settlement agreement reached whereby properties were marketed and then sold, with proceeds of sale equitably distributed among owners. Successfully established at trial claims to lands adversely possessed for more than 20 years against action brought by alleged prior record owner, who failed to establish any acts over the property that would undermine the claimed adverse possession for the required statutory period. Daisy Construction Company v. American Structures, Inc. Represented one of the largest manufacturers of bolted, stainless steel tanks in the country in connection with a dispute over the design specifications for a 2.7 million gallon water tank. Resolved through settlement on the eve of trial. Represented governmental respondents in action brought to challenge denial of plaintiff’s application to operate a waste transfer station in Kent County. Motion to dismiss granted as to due process claims, as well as claims against individual levy court commissioners. Represented college in an action brought by a professor who was denied tenure. Following trial and post-trial briefing, the court ruled in favor of the college, finding that the plaintiff failed to document either material misrepresentations or material omissions by the college president to the Board of Trustees, that the preponderance of the evidence demonstrated that the Trustees based their vote on reasonably accurate information, and that the Trustees did not premise their vote to deny plaintiff tenure on misleading information presented as a result of bad faith or an intent to act unfairly. Represented accounting firm in action against former employee who failed to pay certain damages to employer upon leaving the firm and taking clients with him. Court ruled in favor of accounting firm, finding that employee could not claim credits for payments made by another person against liabilities owed to accounting firm. Represented administrator of estate in complex dispute among family members arising from extensive land holdings of decedents. Protracted litigation was settled on the eve of trial, with the family members conceding to most of the administrator’s claims that properties in dispute were assets of the estate. Following settlement, assisted the administrator with the sale and disposition of numerous properties. Represented pension plan beneficiary in dispute over disbursement of plan assets claimed to be property of the decedent’s estate. The court ruled in favor of the beneficiary, finding that the plan assets were properly designated as distributable to the beneficiary, rather than to the estate. Represented church in dispute with contractor over methods of construction and delays in completing the project. Contractor refused to obtain the necessary certificate of occupancy to allow the church to occupy its new building. A settlement was negotiated pursuant to which the contractor completed the work, the certificate of occupancy was obtained, and the parties submitted their remaining disputes to binding arbitration under the terms of the construction contract. The remaining claims were settled after two days of arbitration. Represented property owner in dispute over construction defects. The Delaware Supreme Court ruled that the damages claimed by the property owner were barred by the economic loss doctrine. Dissatisfied with that result, John introduced legislation in the Delaware General Assembly, that was ultimately signed into law, which had the effect of “overruling” the Delaware Supreme Court’s decision.